Captain Richard A. Peto, Isle of Wight. Odo Cross and Angus Wilson, London, by 1947. Arthur Tooth & Sons Ltd., London. Acquired by the present owner in 1984. C. Boyle-Turner, Les Nabis, Lausanne, 1993, pp. 50-51 (illustrated). A. Salomon & G. Cogeval, Vuillard, Catalogue critique des peintures et pastels, vol. I, Paris, 2003, no. V-75 (illustrated p. 417). On loan to the Southampton Art Gallery, 1947. London, Hanover Gallery, Paintings by Vuillard and Bonhomme, July - August 1948, no. 6. London, Arthur Tooth & Sons Ltd., Recent Acquisitions, November - December 1965, no. 22. London, Arthur Tooth & Sons Ltd., A loan Exhibition in aid of Dorton House School for Blind Children, Sevenoaks, April - May 1969, no. 16 (illlustrated in the catalogue). Femme à la tasse de café is an evocative example of the intimate and enigmatic interiors that Vuillard painted during the 1890s, the period of his celebrated association with the Nabis group. Named for the Hebrew work for 'prophet', the Nabis circle included Pierre Bonnard, Maurice Denis, Paul Sérusier, Ker-Xavier Roussel, Paul Ranson and Félix Vallotton. Highly influenced by the work of Paul Gauguin, the Nabis artists sought to create a purely pictorial art through simplified forms, dramatic lighting effects, foreshortened perspective and exaggerated colour. 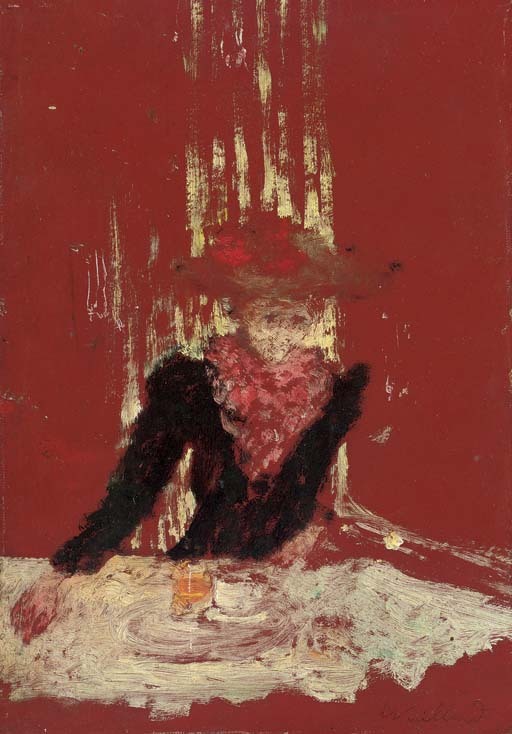 Vuillard's use of the deep red background colour, against which he sets his seated female figure creates a visual tension between the apparent depth of the picture and the dominance of the background. 'Directing' his scenes, Vuillard carefully regulated the lighting and controlled the gestures to produce his desired mood or effect. As Elizabeth Easton discussed, 'It was family life, confined within these ever-present walls, that aroused Vuillard's most powerful emotions. His interiors function as theatres within which the family enacted the consuming drama of everyday experience... Because they express more what the rooms felt like than how they appeared, Vuillard's interiors are most effective as metaphors, speaking for the relationships between the people who occupy them, as well as for Vuillard himself and for the feelings he wanted to convey' (Edouard Vuillard's Interiors of the 1890s, PhD dissertation, New Haven, 1989). With their spatial experiments and their sophisticated play between three-dimensional form and flattened surface, paintings such as the present work heralded the development of abstract art in the early twentieth century.